The Bristol Channel from the Gower peninsula and Ilfracombe up to the Servern Bridges. Scale: 1 : 114.500. One-minute gridlines. 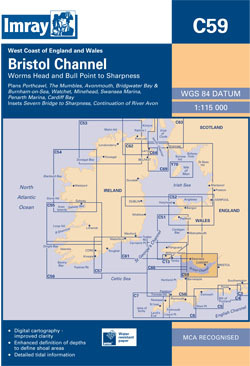 Larger scale plans of Porthcawl, The Mumbles, Avonmouth, Bridgwater bay and Burnham-on-sea, Watchet, Minehead, Swansea marina, Penarth, and the Severn River from the Severn Bridges to Sharpness. Tidal stream diagrams. 2012 EDITION - Fully updated, using the latest available depth surveys throughout.